CBS has the some of the most-watched sitcoms on TV, so any new sitcoms at the very least have some decent lead-ins to theoretically help them build an audience. That was certainly the case for The Crazy Ones, which held onto the lions share of The Big Bang Theory’s gargantuan audience to register 15.61 million viewers and a 4.0 rating on Wednesday. Mom is an Anna Faris vehicle, and as mentioned before comes from the one-man sitcom hit machine, Chuck Lorre (Two and a Half Men, The Big Bang Theory, Mike & Molly). Faris, who seems to have spent most of her career picking projects that don’t match her talent, plays Christy; a single mother who’s on the road to recovery after struggling with drug and alcohol addiction. 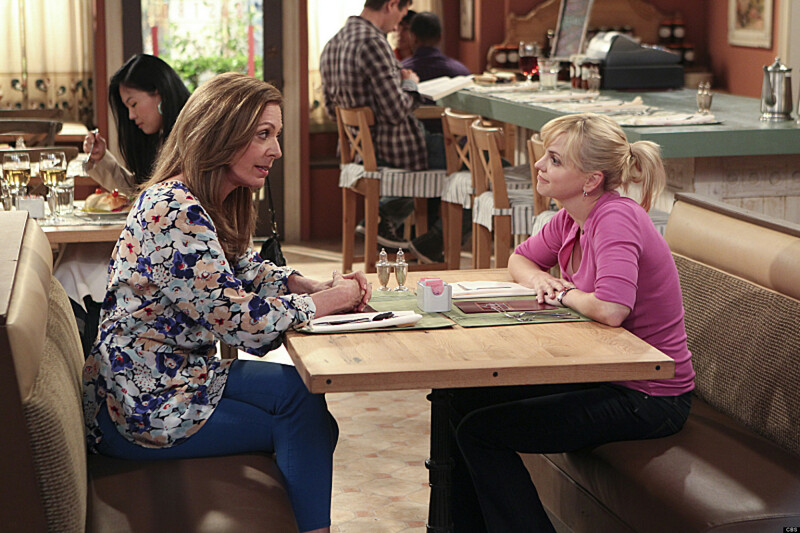 That’s one of the many premises introduced in the first episode of Mom. There are maybe three or four to be found in the pilot. Cindy also works in a restaurant as a waitress, and she’s in a relationship with her married boss (Nate Corddry). At home she’s struggling to rebuild her relationship with her promiscuous teenage daughter Violet (Sadie Calvano), who neither respects or gets along with her. She also has an impressionable younger son (Blake Garrett Rosenthal), who we see less of in the pilot, but whose deadbeat father, her ex-husband Baxter (played by Breaking Bad’s Badger, Matt Jones), she can’t seem to get rid of. And then when Christy’s at rehab she bumps into her own mother (Alison Janney) for the first time in years, who’s oblivious to the damage she’s done to her daughter, but wants to rebuild their relationship. For that reason, it’s hard to really get a handle on Mom and what kind of show it will be moving forward. It kicks off at the restaurant where we get to see the least interesting version of Faris’ Christy; a weepy, self-pitying employee interacting with the least important people in her life. There’s an entirely unjustified Jon Cryer cameo, and we spend far more time in the restaurant’s kitchen (with French Stewart’s chef) than we should. If there’s streamlining to be done, then this is the aspect of the show I’d be happiest to see left behind. I’d also be happy – as much as I like Nate Corddry – to see Mom let Christy be on her own for a while, and focus on the relationships with the women in her life, rather than a man. Maybe that’s something that it could pick back up on later in the run, but from a personal standpoint I was much more interested in the relationships with her mother and her daughter in the pilot. Christy’s substance abuse lends the show an edge, and it’s not something we’d tend to expect from a Chuck Lorre sitcom, or any on CBS for that matter. It’s not something that particularly needs to be explored frequently, but it reminded me of Cheers and how Sam’s strength in overcoming his alcoholism always made it easier to respect him despite his other immature behaviour. It was also occasionally used to drive drama on Cheers, and I like that Mom at least has that in its locker going forward. It also makes the relationship between Christy and her mother even more interesting with the substance abuse intimated to have been almost passed down a generation, and the battle that she faces to keep her own daughter on the straight and narrow. But so many of the things that I liked about Mom were things that I thought it could do, and the direction that it could take, rather than this being a particularly well-constructed episode of television. And in truth, it’s not a particularly funny episode of television either. Faris and Janney are great, and given some decent material in the future they could be very good, but they don’t get given enough of it in this opening episode. It’s not painful to watch or anything like that, but it absolutely gets by on the likeability of its actors rather than the lines that they’re speaking. Mom’s a show I’ll be sticking with for a while to see what direction it takes, and hopefully it can maintain enough of an audience to stay on the air long enough to justify itself. And hey, I already like it more than 2 Broke Girls. CBS were hoping that the return of Robin Williams as a sitcom lead for the first time since Mork & Mindy ended back in 1982 would be enough to make The Crazy Ones a hit. We’ll have to wait and see how the David E. Kelley show performs a little further away from The Big Bang Theory next week, but it’s looking good so far. Williams plays advertising exec Simon Roberts, who runs an agency with his daughter and protege, Sydney, played by Sarah Michelle Gellar. And there’s a lot less going on here than there is in Mom. Basically all you need to know is that Williams is the zany one with a laissez-faire approach, while Gellar is uptight and has a far more serious approach to the business. We’re supposed to be invested in their relationship, but we’re also supposed to be invested in the business, and in the pilot the stakes are high as they attempt to keep hold of their important contract with McDonalds. And, well, excuse me for really, really not caring about whether they can craft a great new advertising campaign for McDonalds. And forgive me for not feeling any emotion when Williams and Gellar make emotional speeches about advertising, or how it tied into their relationship. Maybe we’re supposed to sense the cynicism, but the fact that I didn’t is a problem regardless. Add to that the unpleasant sight of McDonalds logos all over the episode – it doesn’t matter whether they paid for the product placement or are just getting a ton of free advertising – and something about the episode really doesn’t sit well. It needn’t be a problem with the show every week, and even a slight tweak to the way they approach the advertising and familiar products would help. But I certainly didn’t like the approach of the pilot. What I liked more was the main thrust of the advertising plot; convincing Kelly Clarkson to sing the ad’s jingle. To do that Gellar and Williams both get a chance to show off their characters, and the very different approaches they have to their job, as well as the opportunity to bring in some of the agency’s other main players. Hamish Linklater, Amanda Setton and James Wolk, the latter getting the biggest opportunity to show off what he can do in some fun scenes with Robin Williams. 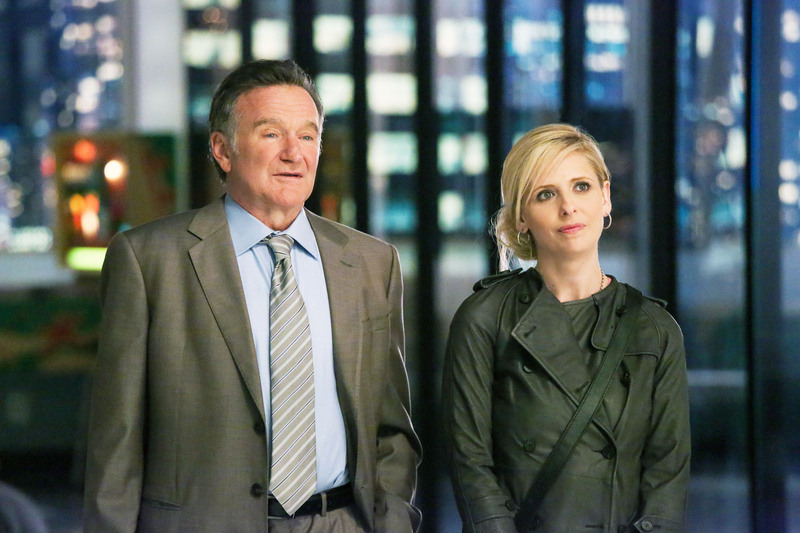 I may have liked Mom more, but I probably laughed more at The Crazy Ones, and a lot of that was down to Robin Williams. Sometimes his schtick can come off a little forced – and at times it does here – but when he started riffing with Wolk, for example, I couldn’t help but grin. But be warned, if Williams ever annoys you then The Crazy Ones really isn’t for you. This is Robin Williams dialled up to 11. It’s hard to know what to make of his character from the pilot. Is he just your average zany Robin Williams character, or is there a suggestion that the character may actually be suffering from some kind of mental illness? I couldn’t really tell, and maybe that’s something the writers will decide whether they want to pursue as the series moves forward. There’s certainly a more tragic side to Williams’ character in some respects, and either way I think we can expect to see some of the tears of a clown that he’s visited with some frequency throughout his career. Gellar’s character doesn’t initially seem as interesting, and neither does she fair as well with the comedy. That’s a fault I’m happy to lay squarely at the feet of the writers, given how funny she could be back on Buffy, and that’s exactly the reason we shouldn’t feel too concerned either. Gellar’s overshadowed by Kelly Clarkson in the pilot, and that just won’t do. To my knowledge, neither this or Mom has a UK air date yet, but I’ll be sure to keep you updated if there’s any change there. Mom actually has been picked up by a UK broadcaster, ITV2, and it will air at some point as yet undetermined point in 2014. We should have a much clearer idea of how good it is by then, and I’ll be similarly sticking with The Crazy Ones for a least a few weeks to see whether it’s something worth watching. UK broadcasters will presumably be doing the same.